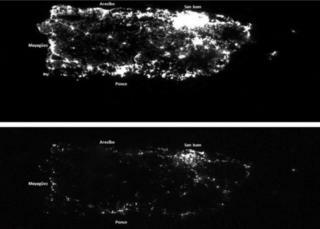 The island's governor warned on Monday of a "humanitarian crisis occurring in America", and called for more aid. "Puerto Rico is part of the United States, and we need to take swift action," Governor Ricardo Rossello told CNN. "This is a major disaster," he added, calling on the US Congress to produce "something tangible, a bill that actually answers to our need right now". The island, which is more than $72bn in debt, is facing the largest bankruptcy case in US history. Gov Rossello warned that lawmakers' failure to address the lack of funding would produce an "exodus" of Puerto Ricans fleeing to the United States. President Donald Trump tweeted on Monday that the island is in "deep trouble" after Hurricane Maria, and that its billions of dollars of debt to Wall Street and banks "must be dealt with". The president did not address how Puerto Rico's debt could be eased. Paul Ryan, the Republican Speaker of the House - the highest ranking member of his party in Congress - tweeted on Monday: "The stories and images coming out of Puerto Rico are devastating. "Congress is working with the administration to ensure necessary resources get to our fellow citizens in #PuertoRico." A curfew from 19:00 to 05:00 is in place to discourage looting and vandalism, and 25 people were arrested on Sunday night for violating the order. More than 95% of mobile phones are without service on the island, where National Guardsman have been prioritising the reopening of ports and airports, to allow more aid to arrive. Adding to the difficulty, some roads are inaccessible and bridges around the island have collapsed, making it nearly impossible to verify the full extent of the damage. 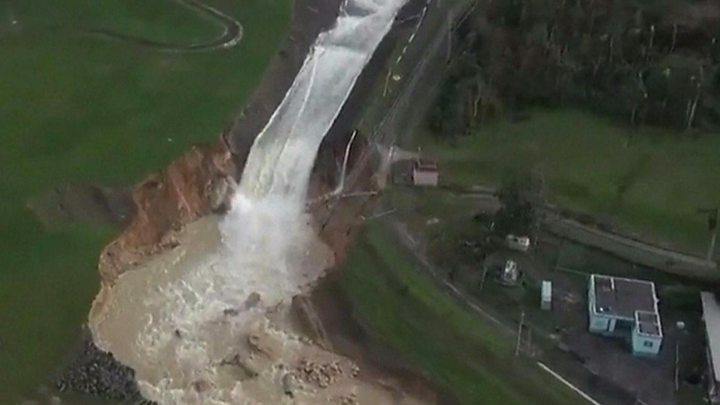 The Guajataca Dam in northwest Puerto Rico is in "imminent" danger of rupturing, causing "life-threatening flash flooding" to at least 8,000 people, emergency crews said on Friday. Residents below the dam have been instructed by the National Guard to evacuate. 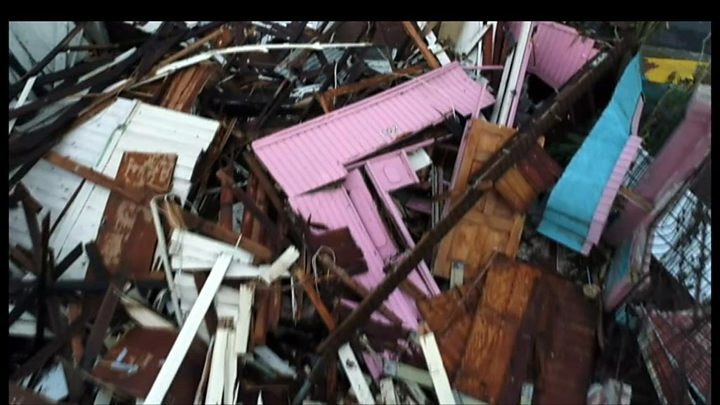 On Sunday, US Marine and Navy teams arrived in to Roosevelt Roads, Puerto Rico - three days after the storm made landfall as a category 4 hurricane, killing at least 13 people. The newly arriving teams will "conduct route reconnaissance, clearance of main roads and clearance of the airfield and associated taxiways", the Pentagon said in a statement on Monday, amid public criticism that the US had not done enough to respond to the widespread destruction. The Pentagon added that the top priority is to "provide life-saving and life sustaining resources" - such as generators and fuel - to Puerto Rico and the US Virgin Islands. The White House defended the government response on Monday. Spokeswoman Sarah Sanders said "we've done unprecedented movement in terms of federal funding to provide for the people of Puerto Rico". "The federal response has been anything but slow," Ms Sanders added. The heads of the Federal Emergency Management Agency (Fema) and the Department of Homeland Security are visiting both island territories on Monday, and US President Donald Trump has vowed to visit at a later date.